Provides Heat Stress Protection for you cat! The Cat Cooling Mat offers cooling relief without the use of gels or refrigerants, using instead the three-layer evaporative cooling material for which Silver Eagle Outfitters is known. 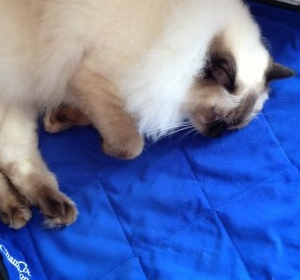 Using regular tap water, the Cooling Mat is easily activated in a few minutes for hours of heat-relief for your cat. Silver Eagle CoolChampions feline cooling pads are a safe and easy way to keep your pet cool on a hot day. Your cat will enjoy hours of cooling relief and protection from the summer heat. Package Activation Method: Silver Eagle cooling vests and blankets are packaged in a zip-lock activation bag. The activation method described below is a quick and easy way to activate your garment. on each item we sell with the exception of any items listed below. We request that you please try on your product to verify the correct size prior to activating the product for cooling. If the item is not the correct size or does not meet the needs of your application, we will either exchange your product or refund the cost of your item, less any associated freight costs. If the product is activated prior to returning it for an exchange or refund, we must charge a 25% restocking fee. Additionally, if you find any defects with the make or function of your product within one full year of purchase, you may return it to us for an exchange or refund.